My gums sometimes bleed when I brush, and my dentist recently said they are also bleeding when he probes them. What could this mean? The percentage of people whose gums occasionally bleed when they brush is actually quite high — as much as 90% of the population, in fact. Bleeding gums is generally a sign that your gums are inflamed, and that you are not brushing and/or flossing optimally. It is actually a response to bacterial biofilm (plaque) that, when left in contact with the gum tissues, causes the earliest form of gum disease, gingivitis (“gingiva” – gum tissues; “itis” – inflammation). About 10-15% of those who have gingivitis go on to develop full-blown periodontal disease (“peri” – around; “odont” – tooth), characterized by loss of the attachment of the tissues that connect to, and support the teeth, including: gum tissues; the periodontal ligament that joins the bone to the tooth; and the bone itself. This leads to gaps developing between the teeth and periodontal (gum) tissues, a condition called periodontal pocketing. 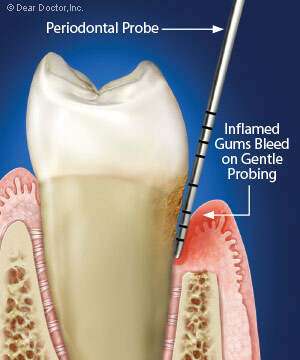 Bleeding gums is generally a sign that your gums are inflamed, and that you are not brushing and/or flossing optimally. The instrument that your dentist, hygienist or periodontist (gum specialist) uses to investigate and determine whether or not you have periodontal disease is called, aptly, a periodontal probe. When it is introduced into the space between gum and tooth, your dentist can learn a lot. And one of the signs of gum disease is whether the tissues bleed on probing. Periodontal probes are tiny, thin instruments with blunted ends that are generally calibrated in millimeters. Your dentist can check the health of your gum tissues by gently inserting the probe into the space between gum and tooth. Dental health professionals use periodontal probes to assess both the quality of the gum tissues (whether they are healthy or not) and the degree of detachment from the teeth — measured in millimeters around each tooth. Bleeding is an important warning sign in a periodontal examination. Repetitive bleeding of sites, whether individual sites or generalized sites around the mouth, may well be an indication of beginning periodontal disease. Bleeding is almost always a sign of disease when coupled with other signs, like suppuration (pus formation) and pocketing. Your dentist will be able to quantify whether your periodontal status is stable or not by probing the depths of your periodontal pockets periodically (every three to six months for example). Inflamed and spongy periodontal (gum) tissues are less resistant to probing, whereas healthy or treated tissues are more resilient and resist probing. Other factors that affect the quality and response of periodontal tissues to probing relate to general health. Pregnant women, or women taking birth control pills, have a greater tendency to bleeding gums on probing examination. This is occasioned by the increase in blood vessels in the gum tissues as a result of increased estrogen/progesterone hormone levels. People with health conditions like diabetes and compromised immune (resistance) systems may also reveal increased bleeding on probing, and more severe periodontal disease. Additionally, those taking drugs that decrease blood clotting, like aspirin or Coumadin, may also experience increased bleeding on probing. On the other hand, tobacco smoking, which has the effect of constricting blood vessels (and reducing the body’s resistance), may disguise the presence of periodontal disease by reducing or, more often, completely eliminating bleeding on probing. All told, there’s a lot your dental health professional can tell with a probing examination — no pun intended — and bleeding on probing is one of those telltale signs that something may be wrong and needs treating. Speak to your dentist and ask for the details. Your bleeding gums may be just one of the pieces of this dental puzzle.